Boyhood is a 2014 American independent coming-of-age drama film, written and directed by Richard Linklater, and starring Patricia Arquette, Ellar Coltrane, Lorelei Linklater, and Ethan Hawke. 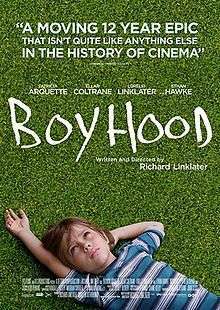 Filmed from 2002 to 2013, Boyhood depicts the childhood and adolescence of Mason Evans, Jr. (Coltrane) from ages six to eighteen as he grows up in Texas with divorced parents (Arquette and Hawke). Richard Linklater's daughter Lorelei plays Mason's sister, Samantha. Production began in 2002 and finished in 2013, with Linklater's goal to make a film about growing up. The project began without a completed script, with only basic plot points and the ending written initially. Linklater developed the script throughout production, writing the next year's portion of the film after rewatching the previous year's footage. He incorporated changes he saw in each actor into the script, while also allowing all major actors to participate in the writing process by incorporating their life experiences into their characters' stories. Boyhood premiered at the 2014 Sundance Film Festival and was released theatrically on July 11, 2014. The film also competed in the main competition section of the 64th Berlin International Film Festival, where Linklater won the Silver Bear for Best Director. The film was nominated for five Golden Globe Awards, winning Best Motion Picture – Drama, Best Director, and Best Supporting Actress for Arquette. It also was nominated for five BAFTA awards, winning for Best Director and Best Film. Additionally, it was nominated for six Academy Awards including Best Picture, Best Director, Best Supporting Actor for Hawke and Best Supporting Actress for Arquette, which she won. Boyhood is now among the most acclaimed films of the 21st century. In 2002, six-year-old Mason Evans, Jr., and his older sister Samantha live with their single mother Olivia in Texas. Mason overhears Olivia arguing with her boyfriend, saying she has no free time due to parenting. In 2003, Olivia moves the family to Houston, so she can attend the University of Houston, complete her degree, and get a better job. Mason's father, Mason Sr., visits Houston and takes the children bowling. He promises to spend more time with them. When he drops the kids off at home, he argues with Olivia while Mason and Samantha watch from a window. Olivia takes Mason to one of her classes, introducing him to her professor, Bill Welbrock; Mason sees them flirt. In 2004, Olivia and Bill have married and blended their two families, including Bill's children from a previous marriage. They share experiences such as playing video games and attending a midnight release of Harry Potter and the Half-Blood Prince. Mason and Samantha are enrolled in the same school as their step-siblings, where Mason meets and befriends a girl named Nicole, who also has a crush on him. In 2005, Mason and Samantha bond with their father Mason Sr. as he takes them out for a day in Houston, culminating in a Houston Astros game and a sleepover at his house with his roommate Jimmy. Olivia continues her education and is initially supportive of Bill's strict parenting style, which includes many chores for the kids and a forced cutting of Mason's long hair. Bill becomes abusive as alcoholism takes over his life. In 2006, when he assaults Olivia and endangers the kids, Olivia moves the family to a friend's house and files for divorce. In 2007, Mason Sr. learns that Samantha has a boyfriend and talks to her and Mason about contraception. He and Mason go camping at Pedernales Falls State Park and bond over the music of Wilco, Star Wars, and Mason's blossoming interest in girls. Mason and Samantha have grown into their new lives in San Marcos, a town close to Austin. In 2008, Mason is bullied by other students at school and teased on a camping trip but starts receiving attention from girls. Olivia teaches psychology at college and moves in with Jim, a student and Bosnian/Iraq War veteran. By 2009, Mason has experimented with marijuana and alcohol. Mason Sr., who has remarried and now has a baby, takes Mason and Samantha to visit his wife's parents. He gives Mason a suit and The Black Album, a mix CD of Beatles solo songs; Mason's step-grandparents give him a personalized Bible and a vintage shotgun. In 2010, Mason is lectured by his photography teacher, who sees his potential but is disappointed in his lack of ambition and hard work. Mason attends a party and meets Sheena, who becomes his girlfriend. After Mason arrives home late one night from a party, a drunk Jim confronts Mason about his late hours. Olivia and Jim eventually split. In 2011, Mason and Sheena visit Samantha at the University of Texas at Austin, where they share their hopes and fears about college, staying up late to watch the sun rise. Samantha's roommate discovers them asleep together in her dorm room. In 2012, during Mason's senior year in high school, he has a painful breakup with Sheena, wins the silver medal in a state photography contest, and is awarded college scholarship money. Mason's family throws him a graduation party and toasts his success. Mason Sr. gives him advice about his breakup. Planning to sell the house and downsize, Olivia meets Samantha and Mason for lunch and asks them to sort through their possessions. In 2013, as Mason prepares to leave his mother's new apartment for college, Olivia breaks down, disillusioned by how fast life's milestones seem to have passed by. At Sul Ross State University in Alpine, Mason moves into his dorm room and meets his new roommate Dalton, Dalton's girlfriend Barb, and Barb's roommate Nicole. Mason eats a marijuana brownie given to him by Barb and the group goes hiking at Big Bend Ranch State Park. Nicole shares with Mason her belief that, rather than people seizing moments, moments seize us, to which Mason agrees. Ellar Coltrane as Mason Evans Jr.
Ethan Hawke as Mason Evans Sr. In May 2002, Linklater said that he would begin shooting an untitled film in his home city of Houston that summer. He planned to assemble the cast and crew for a few weeks' filming annually for 12 years. He said: "I've long wanted to tell the story of a parent–child relationship that follows a boy from the first through the 12th grade and ends with him going off to college. But the dilemma is that kids change so much that it is impossible to cover that much ground. And I am totally ready to adapt the story to whatever he is going through." IFC, the film's distributor, committed to a film budget of US$200,000 per year, or $2.4 million over the 12-year shooting period. Linklater hired the six-year-old Coltrane to play the boy. The cast could not sign contracts for the film due to the De Havilland Law, which makes it illegal to contract someone for more than seven years of work. Linklater told Hawke that he would have to finish the film if Linklater died. Ellar Coltrane portrayed the film's protagonist, Mason Jr.
Boyhood began filming without a completed script. Linklater had prepared each character's basic plot points, and the ending—including the final shot—but otherwise wrote the script for the next year's filming after rewatching the previous year's footage, incorporating the changes he saw in each actor. All major actors participated in the writing process, contributing their life experiences; for example, Hawke's character is based on his and Linklater's fathers—both Texan insurance agents who divorced and remarried—and Arquette's character is based on her mother, who resumed her education later in life and became a psychotherapist. People think I asked Ellar, "What did you do in school the other day? Let's make a scene about that!" That never happened. The time we spent together was me just gauging where he was at in his life—what his concerns were and what he was doing. Then I would think, maybe we could move the camping trip up, and we can do this or that. Scripts for certain scenes were sometimes finished the night prior to shooting. According to Hawke, the discussion about the possibility of additional Star Wars films is "the only honest-to-god improvised moment in the movie". The cast and crew gathered once or twice each year, on varying dates, to film for three or four days. The production team spent approximately two months in pre-production, and one month in post-production each year. When Arquette became the lead on the TV series Medium, she filmed her scenes over weekends. It's Tolstoy-esque in scope. I thought Before Sunrise was the most unique thing I would ever be a part of, but Rick has engaged me in something even more strange. Doing a scene with a young boy at the age of seven when he talks about why do raccoons die, and at the age of 12 when he talks about video games, and 17 when he asks me about girls, and have it be the same actor—to watch his voice and body morph—it's a little bit like time-lapse photography of a human being. Although Linklater had referred to the project as Boyhood during the early years of production, in 2013 he settled on the title 12 Years, but was forced to rename it by the release of 12 Years a Slave in the same year. Hawke was amazed that the producers "still had their job" at the film's completion, despite "(having) to hide a couple hundred thousand dollars a year for over a decade while we slowly made this movie". Despite the risks, Linklater was allowed an unusual level of freedom with the production, never having to show IFC the work as it progressed. Costume designer Kari Perkins had to review each year's footage to ensure there were no accidental repetitions and to create a "flow" to the costumes. "We very intentionally shot in the same way throughout, just to get a unified look. 35mm negative is about the most stable thing you could shoot on. We kinda had that from the beginning. I remember it not even being a question. You know the HD formats, I didn't really like them very much at all. I'm just not warming up to them. But they change a lot. The film would have six different looks if we tried to keep up." Boyhood premiered theatrically on July 11, 2014, in a limited release in four theaters in North America and grossed $387,618, with an average of $77,524 per theater, ranking number 19 at the box office. The film expanded the next week to 34 theaters and grossed $1.2 million, with an average of $34,418 per theater. The film's wide release occurred on August 15, opening in 771 theaters and grossing $2 million, with an average of $2,584 per theater and ranking number 11. The film's widest release in the U.S. was 775 theaters. The film ultimately earned $25.4 million domestically and $21 million internationally for a total of $46.4 million, against a $4 million production budget. On Rotten Tomatoes, the film holds a "Certified Fresh" score of 98%, based on 275 reviews, with an average rating of 9.2/10. The critical consensus states, "Epic in technical scale but breathlessly intimate in narrative scope, Boyhood is a sprawling investigation of the human condition." On Metacritic, the film has a perfect score of 100 out of 100, based on 50 reviews. It is the highest rated of all films reviewed upon their original release on the site, and one of only three films in the site's history to achieve a perfect aggregate score. It also holds the highest number of reviews for a film with a score of 100. Patricia Arquette won an Academy, BAFTA, Critics' Choice, Golden Globe, and SAG Award for her performance in the film. A collection of 25 French critiques on AlloCiné, including those from Le Monde and Cahiers du Cinéma, indicates wide approval, with an average score of 4.0 out of 5. In her review for The New York Times, Manohla Dargis stated that the film's realism was "jolting" and "so brilliantly realized and understated that it would be easy to overlook". A. O. Scott, also writing for The New York Times, called Boyhood the best film of 2014, saying that he could not think of any film that had affected him the way Boyhood had in his 15 years as a professional film critic. Peter Travers of Rolling Stone also named Boyhood the best movie of the year, calling it the year's "biggest emotional powerhouse". Peter Bradshaw of The Guardian called it "one of the greatest films of the decade". Richard Roeper gave the film an A+, calling it one of the greatest films he had ever seen. Wai Chee Dimock, writing in the Los Angeles Review of Books, compared Linklater's film with Nobel laureate J. M. Coetzee's memoir, Boyhood: Scenes from Provincial Life. Many critics singled out Patricia Arquette's performance for praise. Mick LaSalle of the San Francisco Chronicle said that watching Arquette was "like watching a generation's hopes and struggles, presented by an actress with a fullness of emotion, and yet with utter matter-of-factness". Michael Phillips, writing for the Chicago Tribune, lauded Arquette's "lack of pretense or affectation as a performer". Ethan Hawke received his fourth Academy Award nomination for his performance. Boyhood also earned the admiration of other filmmakers and artists. Director Christopher Nolan named Boyhood as his favorite film of 2014, calling it "extraordinary". Writer-director Mike Leigh, while accepting a fellowship from the British Academy of Film and Television Arts in 2015, called it "the definitive independent film". Writer Joyce Carol Oates tweeted her support, saying: "It is rare that a film so mimics the rhythms and texture of actual life as Boyhood. Such seeming spontaneity is a very high art." Poet and critic Dan Chiasson wrote in a contribution to The New York Review of Books: "This is a great film, the greatest American movie I have ever seen in a theater. It is great for what we see, but it is even greater for its way of making real what we cannot see, or for suggesting that what we cannot yet see we might one day see." According to Canadian philosopher Howard Adelman, "[Boyhood] is Huckleberry Finn for the twenty-first century, for it is only Mason Jr. who retains his honesty, integrity and sense of decency throughout ... a masterful movie not to be missed." Alejandro González Iñárritu, winner of the Academy Award for Best Director in 2015 and Linklater's fellow nominee, said that when he watched Boyhood, he sent an email to Linklater and thanked him for giving "this incredible gift". Other critics reacted less positively to the film. Los Angeles Times critic Kenneth Turan described it as "at best, OK" and one whose "animating idea is more interesting than its actual satisfactions". Sam Adams of IndieWire argued that the unanimous praise for Boyhood is bad for film criticism, as it tends to marginalize the analysis of critics who disagree with the majority; Adams further elaborated that masterpieces are not made "by unanimous praise, but by careful scrutiny". Richard Brody of The New Yorker listed the film at the top of a year-end list he called "The Negative Ten", a list of films with "significant merit", but that also "occluded the view toward the year's most accomplished and daringly original work". The international film magazine Sight & Sound named it the best film of 2014 after polling an international group of 112 film critics. Both Metacritic and Rotten Tomatoes listed Boyhood as the best-reviewed film of 2014. Boyhood appeared on more critics' annual "best-of" lists in 2014 than any other film, including the most first-place votes. According to CriticsTop10.com, it was included on 536 lists and topped 189 of them—with the latter being a record by that site's count. In a 2016 poll by BBC Culture, critics ranked Boyhood as the fifth greatest film since 2000. Yeah, we've got a ton of behind the scenes stuff. We made this in the era where everyone has a digital camera so we unearthed an interview from year one with Ellar, Lorelei, Patricia and myself, Patricia interviewed me in 2002. I hadn't seen this since we shot it, Ellar had forgotten quite a bit of it but he got to see himself as a wide-eyed six year old. For people who like the movie, I think there will be a lot of cool little treasures. On August 21, Variety reported that Paramount Home Media Distribution had acquired the U.S. home entertainment rights for DVD, Blu-ray and digital distribution. IFC Films will retain VOD and EST sales as part of the deal. The film became available on Digital HD on December 9, 2014, and was released on Blu-ray and DVD on January 6, 2015. The Criterion Collection announced a special edition of the film to be released on Blu-Ray and DVD on October 18, 2016. Boyhood earned dozens of accolades, including top prizes from the New York Film Critics Circle, the Los Angeles Film Critics Association, the Chicago Film Critics Association, the Broadcast Film Critics Association, and the London Film Critics' Circle. It received both the Golden Globe Award and the British Academy Film Award for Best Film. At the 87th Academy Awards, it received its sole Oscar for Supporting Actress, losing the other nominations to Birdman and Whiplash. Boyhood was parodied by the popular TV series The Simpsons. In their twenty-seventh season episode "Barthood", the episode shows the life of Bart through the years. ↑ "BOYHOOD (15)". British Board of Film Classification. June 5, 2014. Retrieved January 15, 2015. 1 2 "Boyhood (2014)". Box Office Mojo. July 11, 2014. Retrieved February 16, 2015. ↑ "Richard Linklater's Ambitious 'Boyhood' Premieres at Sundance". Slashfilm.com. January 13, 2014. Retrieved April 27, 2014. ↑ Neumyer, Scott (October 25, 2013). "Richard Linklater Talks Before Midnight, Boyhood, and a Possible TV Series". Parade. Retrieved November 3, 2013. ↑ "Berlinale 2014: Competition Complete". berlinale. Retrieved January 15, 2014. ↑ "The Awards Of The 64th Berlin International Film Festival". berlinale. Retrieved January 15, 2014. ↑ "The Best Movies of the 21st Century (So Far)". Retrieved 16 February 2016. 1 2 Blackburn, Rachel. (May 16, 2002) PA News Shooting begins on film that will take 12 years. 1 2 3 Chang, Justin (June 25, 2014). "Richard Linklater on 'Boyhood,' the 'Before' Trilogy and the Luxury of Time". Variety. Retrieved July 4, 2014. 1 2 Carroll, Larry (November 29, 2006). "Got Plans For 2013? Check Out Richard Linklater's '12-Year Movie'". MTV Movies. Retrieved April 27, 2014. ↑ Rea, Steven (May 19, 2002). "De Niro reassures a studio about a boy". The Philadelphia Inquirer. Features Arts & Entertainment section, page H9. 1 2 O'Brien, Conan (host); Hawke, Ethan; Rajskub, Mary Lynn; Scott, Jamie (2014-08-05). "Full Episode — Tues. 8/5 – Ethan Hawke, Mary Lynn Rajskub, And Musical Guest Jamie Scott". Conan. TBS. 1 2 3 4 Stern, Marlow (July 10, 2014). "The Making of 'Boyhood': Richard Linklater's 12-Year Journey to Create An American Masterpiece". The Daily Beast. Retrieved December 13, 2014. ↑ McKittrick, Christopher. ""I want to tell a story in a new way" – Linklater on Boyhood". Creative Screenwriting. Retrieved January 10, 2015. ↑ "Boyhood Q&A". Santa Barbara International Film Festival. Retrieved January 22, 2015. ↑ Jagernauth, Kevin (June 6, 2013). 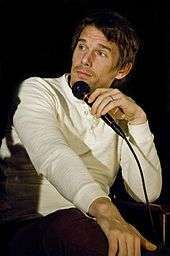 "Ethan Hawke Says Richard Linklater's Secret, Long Developing 'Boyhood' Will Be Released In 2 Years". Indiewire. The Playlist (blog). Retrieved 8 June 2013. ↑ Wooding, Andy (February 23, 2015). "In Conversation: Kari Perkins (Boyhood costume designer)". Film Doctor. Retrieved February 23, 2015. ↑ "The Challenges Of A 12-Year Film Shoot, According To "Boyhood" Director Richard Linklater". Co.Create. Retrieved 2016-04-08. ↑ "Boyhood (2014) – Box Office Mojo". ↑ "Boyhood". Rotten Tomatoes. Retrieved August 10, 2014. ↑ "Boyhood Reviews". Metacritic. Retrieved July 18, 2014. ↑ "Highest Rated Movies of All Time". Metacritic. Retrieved July 20, 2014. ↑ "The Best Movies of All Time". Retrieved 11 May 2016. ↑ "Boyhood critiques presse et spectateurs". Allocine. Retrieved August 27, 2014. ↑ Manohla Dargis. "Movie Review: Boyhood". The New York Times. Retrieved December 31, 2014. ↑ A.O. Scott. "A.O. Scott's Top 10 Movies 2014". The New York Times. Retrieved December 31, 2014. ↑ "10 Best Movies of 2014". Rolling Stone. Retrieved December 31, 2014. ↑ Peter Bradshaw. "Boyhood review – one of the great films of the decade | Film". The Guardian. Retrieved July 18, 2014. ↑ "Boyhood | Richard Roeper Reviews". YouTube. Retrieved July 18, 2014. ↑ "Boyhood review: Linklater changes the game". San Francisco Chronicle. Retrieved January 14, 2015. ↑ "Boyhood review". Chicago Tribune. Retrieved January 14, 2015. ↑ "Christopher Nolan on Interstellar critics". The Hollywood Reporter. Retrieved February 8, 2015. ↑ "Baftas 2015 awards: the Baftas should be bold - not boring". The Daily Telegraph. Retrieved February 9, 2015. ↑ "Joyce Carol Oates on Twitter". Twitter. Retrieved February 8, 2015. ↑ "Making Real What We Cannot See". The New York Review of Books. Retrieved September 25, 2014. ↑ Adelman, Howard (September 16, 2014). "Movie Review: Richard Linklater's Boyhood". Retrieved March 4, 2015. ↑ "Alejandro G. Inarritu on Oscar Glory and Why He Wouldn't Have Minded Losing". Variety. Retrieved April 3, 2015. ↑ Kenneth Turan. "Kenneth Turan takes a critic's lonely stand on Boyhood". Los Angeles Times. Retrieved August 7, 2014. ↑ Sam Adams. "Why the unanimous praise for Boyhood is bad for film criticism and for Boyhood". IndieWire. Retrieved August 7, 2014. ↑ Richard Brody. "The Best Movies of 2014". The New Yorker. Retrieved December 31, 2014. ↑ S&S Contributors. "The best films of 2014". Sight & Sound. Retrieved November 28, 2014. ↑ "Best Movies for 2014". Metacritic. Retrieved December 31, 2014. ↑ "Top 100 Movies of 2014". Rotten Tomatoes. Retrieved December 31, 2014. ↑ "Film Critic Top 10 Lists". Metacritic. Retrieved December 26, 2014. ↑ "The Top Ten Lists". Movie City News. Retrieved January 1, 2015. ↑ "Best of 2014". CriticsTop10. Retrieved January 10, 2016. ↑ Jeffrey M. Anderson. "2014's best films". San Francisco Examiner. Retrieved September 8, 2015. ↑ Marjorie Baumgarten. "Marjorie Baumgarten's Top 10 List". The Austin Chronicle. Retrieved January 2, 2015. ↑ Peter Bradshaw. "And the Braddie goes to...". The Guardian. Retrieved December 18, 2014. ↑ Justin Chang. "Justin Chang's Top 10 Films of 2014". Variety. Retrieved December 19, 2014. ↑ Simon Crook. "Boyhood: The 50 Best Films of 2014". Empire. Retrieved December 12, 2014. ↑ A.A. Dowd. "The 20 Best Movies of 2014". The A.V. Club. Retrieved December 18, 2014. ↑ David Edelstein. "The 11 Best Movies of 2014". New York. Retrieved December 9, 2014. ↑ Bill Goodykoontz. "Top 10 Movies of 2014". The Arizona Republic. Retrieved December 18, 2014. ↑ Stephen Holden. "Stephen Holden's Best Movies 2014". The New York Times. Retrieved December 11, 2014. ↑ Ann Hornaday. "The Best Movies of 2014". The Washington Post. Retrieved November 27, 2014. ↑ Peter Howell. "Top 10: Boyhood Leads Peter Howell's Favourite Movies of 2014". Toronto Star. Retrieved December 26, 2014. ↑ Eric Kohn. "The Best Films of 2014". Indiewire. Retrieved December 8, 2014. ↑ Mick LaSalle. "Mick LaSalle's Top Ten". San Francisco Chronicle. Retrieved December 26, 2014. ↑ Bob Mondello. "Favorite Films of 2014: Why Stop at 10?". NPR. Retrieved January 1, 2015. ↑ Joe Morgenstern. "The Best Films of 2014: Boyhood and other rare gems". The Wall Street Journal. Retrieved January 1, 2015. ↑ Andrew O'Hehir. "Andrew O'Hehir's Top 10 Movies of 2014". Salon. Retrieved December 31, 2014. ↑ Michael Phillips. "Best and worst movies of 2014". Chicago Tribune. Retrieved January 1, 2015. ↑ Claudia Puig. "Claudia Puig's movie of the year". USA Today. Retrieved January 1, 2015. ↑ Richard Roeper. "Best of 2014: The ten movies that moved me". Chicago Sun-Times. Retrieved December 18, 2014. ↑ Joshua Rothkopf. "The 20 best movies of 2014". Time Out New York. Retrieved December 10, 2014. ↑ A.O. Scott. "A.O. Scott's Top 10 Movies 2014". The New York Times. Retrieved December 11, 2014. ↑ Betsy Sharkey. "Betsy Sharkey's best films of 2014". Los Angeles Times. Retrieved December 20, 2014. ↑ Sight & Sound contributors. "The best films of 2014". BFI. Retrieved November 30, 2014. ↑ Peter Travers. "10 Best Movies Of 2014". Rolling Stone. Retrieved December 4, 2014. ↑ Tom Brook. "Talking Movies' top 10 films of 2014". BBC News. Retrieved December 18, 2014. ↑ Robbie Collin. "The five best films of 2014". The Daily Telegraph. Retrieved December 18, 2014. ↑ Seth Malvín Romero. "A.V. Wire's Top 10 Films of 2014". A.V. Wire. Retrieved January 5, 2015. ↑ Richard Corliss. "Top 10 Best Movies". Time. Retrieved December 5, 2014. ↑ Chris Nashawaty. "10 Best Movies of 2014". Entertainment Weekly. Retrieved December 5, 2014. ↑ Kyle Smith. "The Post's critics' top 10 movies of 2014". New York Post. Retrieved December 8, 2014. ↑ Mark Kermode (December 30, 2014). "My Top Ten Films of 2014 - Part 2". BBC. Retrieved January 28, 2015. ↑ Rex Reed. "The Best Films of 2014". New York Observer. Retrieved December 18, 2014. ↑ "Top 10 movies of the year". The Sydney Morning Herald. December 2014. Retrieved 29 February 2016. ↑ James Berardinelli. "The 2014 Top 10". Reelviews. Retrieved January 1, 2015. ↑ Richard Lawson. "Best movies of 2014". Vanity Fair. Retrieved December 8, 2014. ↑ Todd McCarthy. "Todd McCarthy's 10 Best Films of 2014". The Hollywood Reporter. Retrieved December 26, 2014. ↑ Christopher Orr. "The Best Movies of 2014". The Atlantic. Retrieved January 1, 2015. ↑ Peter Rainer. "The 10 best movies of 2014". The Christian Science Monitor. Retrieved December 18, 2014. ↑ Lou Lumenick. "The Post's critics' top 10 movies of 2014". New York Post. Retrieved December 8, 2014. ↑ The Editors (18 December 2014). "The Individual Top Tens of 2014". RogerEbert.com. Ebert Digital LLC. Retrieved 22 June 2015. ↑ Manohla Dargis. "Manohla Dargis's Best Movies of 2014". The New York Times. Retrieved December 11, 2014. ↑ David Denby. "The 10 Best Movies of 2014". The New Yorker. Retrieved December 18, 2014. ↑ Steven Rea. "Steven Rea's 10 Best Films of 2014". The Philadelphia Inquirer. Retrieved December 18, 2014. ↑ Dana Stevens. "The top 10 movies of 2014". Slate. Retrieved December 18, 2014. ↑ "The 21st century's 100 greatest films". BBC. August 23, 2016. Retrieved October 9, 2016. ↑ "'Boyhood' director Richard Linklater talks about the star's unwavering 12-year commitment". Hypable. July 18, 2014. Retrieved August 22, 2014. ↑ "'Boyhood' to Grow Old with Paramount on Home Entertainment Platforms". Variety. August 21, 2014. Retrieved August 22, 2014. ↑ "Exclusive: 'Boyhood' heads to DVD in January". October 10, 2014. ↑ "Boyhood (2014) - The Criterion Collection". July 15, 2016.